The Angry Koala Gear crew is definitely getting in gear for San Diego Comic Con 2014! We are looking at just about a month away and the exclusives continue to roll in. Each year we always get excited for what is to come, especially for Star Wars exclusives. This year is definitely another big one for Star Wars fans from Hasbro, Funko, Hallmark, Mattel's debut in Star Wars x Hot Wheels, and Jakks Pacific is joining in with a Star Wars 31" exclusive Shadow Stormtrooper limited to only 500. The Hollywood Reporter featured the story first about this amazing San Diego Comic Con Star Wars exclusive. Jakks Pacific first introduced this giant sized 31" Star Wars line last year at SDCC. We are very pleased with this line and are owners of a couple of Darth Vaders and Troopers. 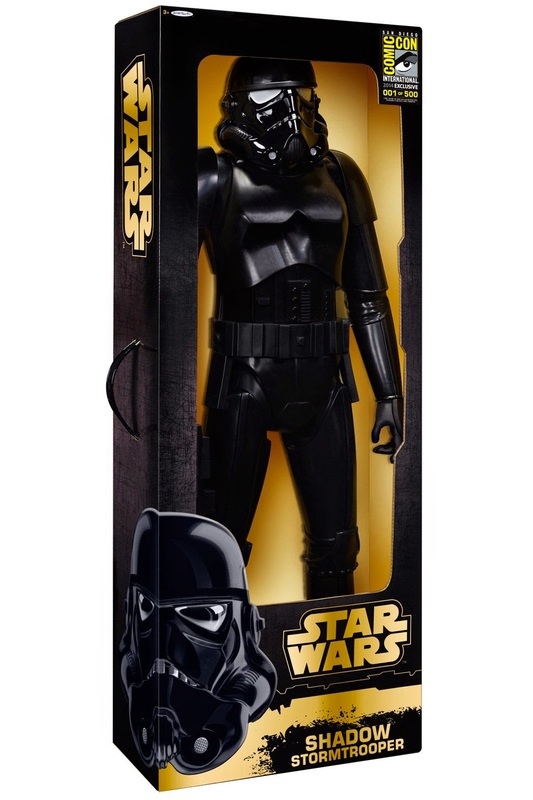 The exclusive SDCC 31" Star Wars Shadow Stormtrooper will have 7 points of articulation and include an imperial blaster. Limited to only 500 pieces worldwide and having a price tag of $50, these will sell out very quickly!